CyberLab has been the home of next-level online education development at IUPUI since 1996. The proof is in the pomegranate. 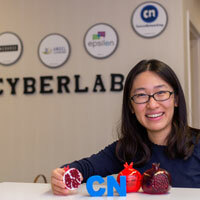 The fruit is known for its richness in antioxidants and its many seeds, the idea of which CyberLab director Ali Jafari used for one of his successful projects, CourseNetworking. The software, which can be used in online coursework, was designed for the social media era. Interaction between instructors and students is key in the familiar Facebook or LinkedIn world of posts, likes and DMs. Successful use of the program earns users seeds for their virtual pomegranate, an encouragement tool. The success of CourseNetworking is certainly worth a seed or three. "CN is in more than 170 countries," said Jafari, a professor of computer information technology in the School of Engineering and Technology. "We are giving it away for free and licensing it to institutions. It's becoming a profit-making company already." In Jafari's youth, the pomegranate was a symbol of prosperity and ambition. Prosperity has been seen in CyberLab with the successful sale of ANGEL Learning, a learning management system used by institutions worldwide, to Blackboard for $100 million. Seven million of that sum went to the building of CyberLab's current home, the Science and Engineering Laboratory Building. CyberLab is buzzing with the launch of Rumi, the space's first artificial intelligence software, expected around the new year. Inspired by 13th-century writer, philosopher and scholar Rumi, the program will interact with users throughout their online education journey. "This is very, very unique. No one has done something like this," Jafari said. "We are using machine learning. The more the student uses Rumi, the more useful Rumi becomes. We needed to develop Rumi like a movie character. The most difficult part is having it connect to you and for you to trust Rumi." To complete Rumi, Jafari has utilized a broad mix of talents. His graduate and undergraduate student interns come from programs like computer information technology, electrical and computer engineering, and computer graphics and technology. He and CyberLab associate director Alice Zhou also hire students majoring in graphic design and creative writing for visual appeal and communicative writing. "We are doing research and entrepreneurship," Jafari said. "The idea is to not just publish a paper. The plan is that whatever you're doing, you need a business plan from the very beginning of how you want to commercialize it." Most of the action occurs in CyberLab's research and development space. Tables and Apple desktops are scattered around, but most students bring their own laptops and promptly get to work. Student interns like junior Bola Adeniyi have had to learn excellent time management to meet deadlines while working individually or collaborating with other CyberLab staff and interns. "It's been pretty fast but at the same time interesting," said Adeniyi, the lab's software quality assurance and testing intern. "I test the CourseNetworking site to make sure there are no bugs. If there are, I report the bugs to the developer to test. You have to put yourself in the user's shoes." The coding and design work can be seen by passersby. CyberLab's conference room and research space boast floor-to-ceiling windows. Two LED screens showcase recent work and profiles on the CyberLab team near the entrance. The conference room contains large whiteboards for brainstorming before the developers move into the research space. It's also home to presentations and client meetings. The small lab has a full kitchenette to fuel long hours of creating the next online education breakthroughs. Three large drawers are stocked with granola bars, ramen noodles and potato chips. Above the snacks, a large board displays the team's various schedules. Nearby, computer hardware from the 1980s represents Jafari's start in software and hardware development, including his dissertation project from Indiana University. "I made it from scratch," Jafari said with a smile. "It still works. I put all of the wires in and did the circuit design. Of course, right now, I'm just focusing on software." Alexa Clingerman, a computer information technology senior, believes her year working in CyberLab helped land her an associate technical consultant position at Appirio, a strategic partner with Salesforce. She started as a web development intern before being moved to the ePortfolio project manager. "I was definitely able to gain a lot of project management and business skills as well," Clingerman said. "I had to learn how to build and manage a sales pipeline, marketing for sales packages, how to communicate with clients, do demos and trainings -- a lot of things outside of my comfort zone, but it's all been very beneficial to me in landing this job and for the future."